During our hot and buggy summers, it’s an amazing luxury to be able to relax outside, protected from mosquitoes and other bitey things on a screened porch. But all screened porches are not created equal, and there are five key must-haves for a great one. 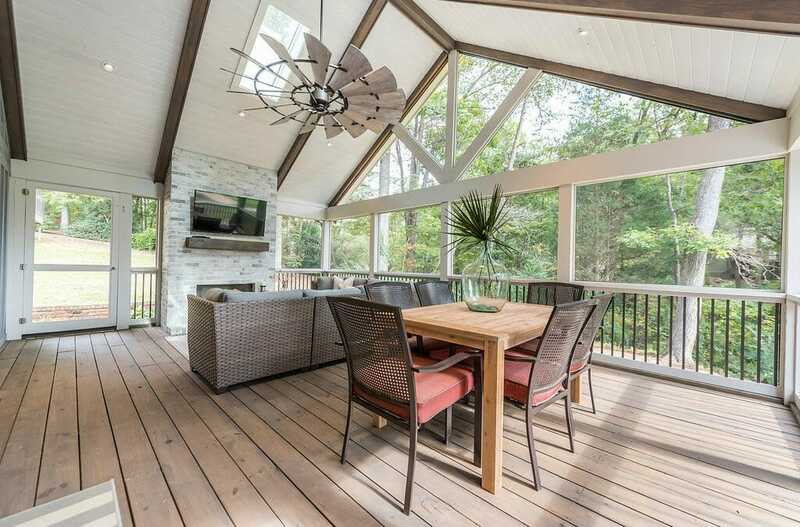 The perfect screened porch has lots of room for everyone to hang out. Think of it as — at least — an outdoor family room, with plenty of places to relax. You’ll want lots of seating, like couches, easy chairs, or daybeds (which are perfect for a lazy afternoon nap or reading nook). With enough space, your screened porch can turn into a great room, with different living zones. There’s the lounging area, with enough floor space to create a dining area so that the family can sit down together for meals. You can also take preparing those meals outside — going beyond just a grill with a fully functional outdoor kitchen with running water, a cooktop, pizza oven, fridge, and more. Pro Tip: Opt for furniture that can withstand some weather — upholstered in durable fabrics like Sunbrella. Going beyond one or two outdoor outlets gives you more options for lighting and entertainment. Recessed ceiling lights extend the outdoor fun into the night — and dimmers allow you to set the right mood. Outdoor speakers bring you favorite music outside with you, and outdoor TVs are increasingly popular — for family movie nights or relaxing and watching an afternoon game (instead of mowing the lawn). Pro Tip: In-floor outlets let you add lamps or keep your devices charged while you’re outside — that work-from-home day just got a little better. The right flooring adds so much to your outdoor space. Traditional decking is great, with spaces in between the planks, but if your porch is above ground, it’s important to add screening beneath the flooring as well. You have to keep the insect population from coming in from underneath! Pro Tip: Depending on the site, and your own preference, other floor materials to consider include tongue-in-groove hardwood floors or a wide variety of tile. Having a ceiling fan or two will boost comfort on even the hottest days, help with air flow, and look amazing. The cooling breeze turns scorching to sultry, increasing the time you can spend outside. And there’s no denying that the sight of a slowly spinning fan defines the charm of southern living. Pro Tip: Make sure your ceiling fan isn’t too close to a ceiling light fixture — it can create an annoying light pattern as it spins. Adding a fireplace to your screened porch takes it to another level, making it truly a three-season outdoor living space. Having the fire as a heat source makes those cool spring evenings or crisp fall days perfect times for being outside. And there’s no mistaking the style statement it makes, turning a screened porch into your own version of resort living. Pro Tip: Wood, gas, and ethanol burning fireplaces are all available, and one may be a better choice depending on your own porch design and site. Are you ready for the indoor-outdoor living possibilities a great screened porch can give you? Give us a call!